It is never in stone. Just because we start out with one idea doesn't mean we have to stick with it. We might even actually get to the end of a painting and still make a significant change. If it leads to a better painting we have to give ourselves permission to make changes. We have to overcome the fear we sometimes have of brushing out something that is not working. I experienced this freedom to change today. I had some time in the studio and wanted to paint but I didn't want to start something new. 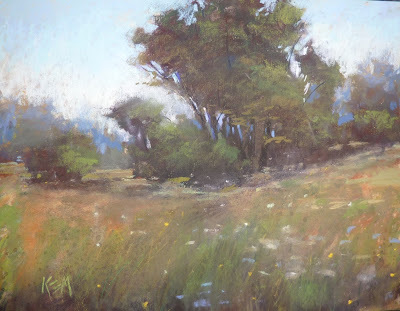 So instead I pulled out a demo I did for my workshop in Vermont this past June. Have a look at it in the photo below. It had some marks from transport. And because it was a demo I was now looking at it with fresh eyes. It had decent enough bones but I thought it needed a change. It really needed some color! 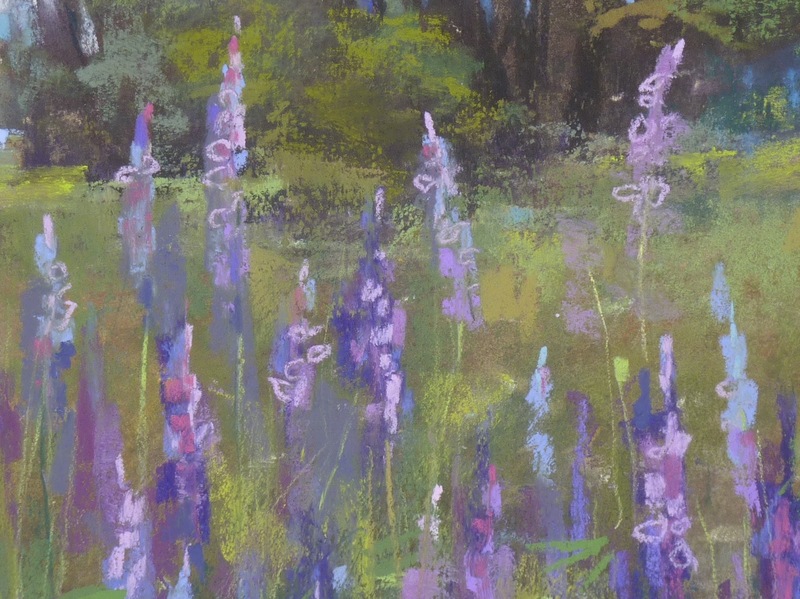 It needed some lupines! That is one of the things I love about painting. I have the freedom to alter reality. 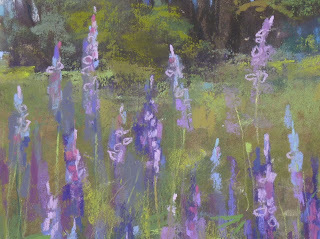 I could plant lupines in a meadow that had Queen Annes Lace. We sometimes forget that we have this freedom to make changes! I took out a stiff bristle brush and brushed out the busy flowers. It was looking better already! I sprayed the foreground with some workable fixative and started adding some blues and pinks for my Lupines. 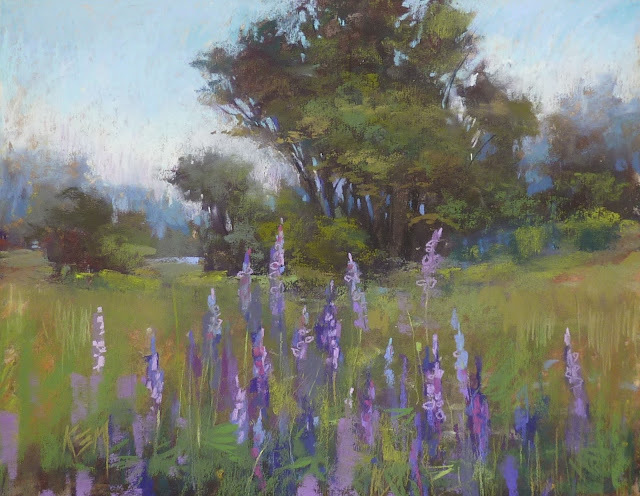 I did have another reference photo of some lupines I saw on a walk during my workshop and I used the photo to refresh my memory. 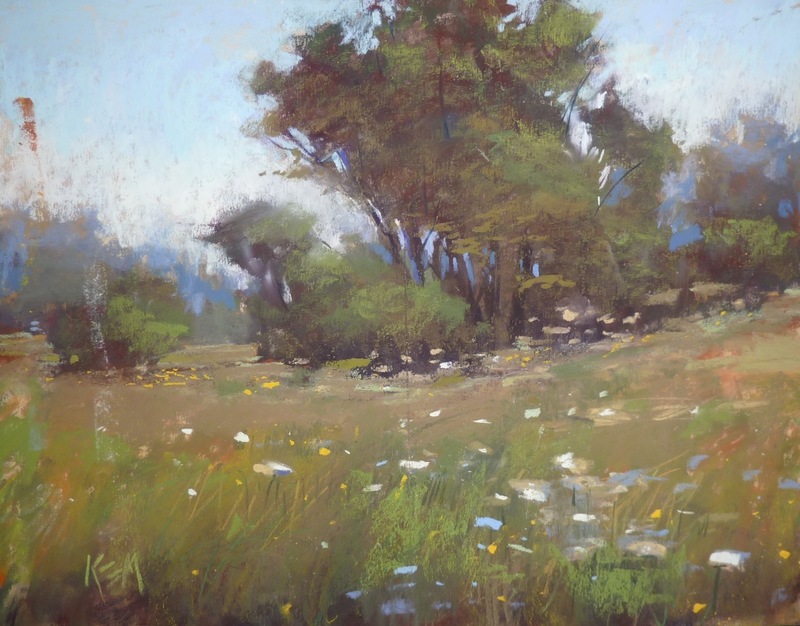 I also refined the tree and added brighter greens to the grasses. It truly was liberating to make an unexpected change but a change that made the painting more interesting.